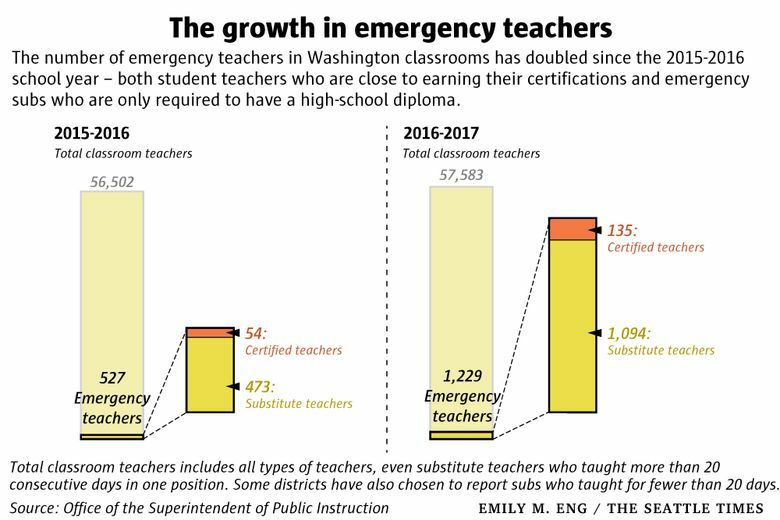 In many school districts across Washington, the supply of substitute teachers is slim enough that individuals without a teaching certificate or even a college degree can serve as substitutes. When they have no other option, school districts can hire people without teaching certificates — or even a college degree — to fill temporary teacher vacancies. Two years ago, districts reported 527 such individuals teaching in their classrooms. This school year, the number has more than doubled to 1,229. 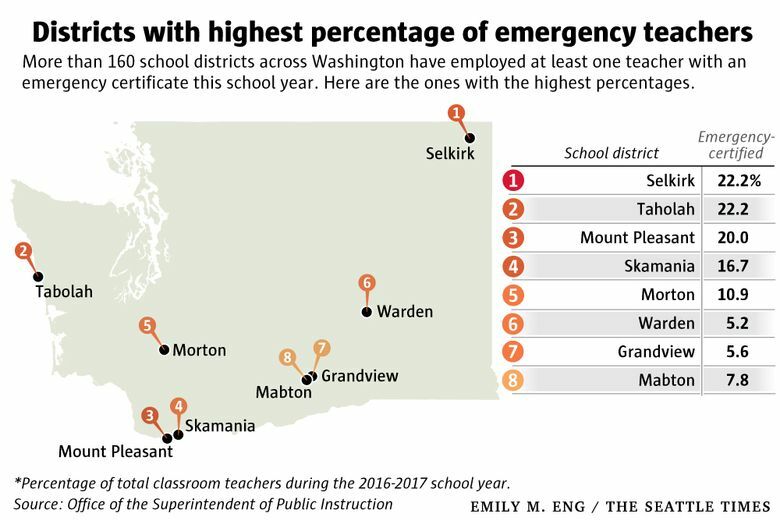 Of the state’s 295 school districts, 168 employed at least one “emergency” teacher this school year, according to data collected by the Office of the Superintendent of Public Instruction (OSPI). The districts with highest percentages of emergency teachers tend to be small, with many students from low-income families. Maria Flores, director of teacher and principal quality for OSPI, says the ranks of emergency teachers are growing for a combination of reasons: K-3 class-size reductions, growing teacher attrition and baby-boomer retirements. There are two types of emergency teachers: “emergency-certified teachers” and “emergency substitute teachers.” To hire either, districts must show the state that they’ve exhausted their pool of qualified applicants. Emergency certified teachers must have a bachelor’s degree and have completed a significant portion of a teacher-preparation program.Emergency substitute teachers can be anyone with a high-school diploma. They’re sometimes parents or teaching assistants, said David Kinnunen, OSPI’s director of professional certification. OSPI’s data doesn’t include the whole picture — most districts only reported emergency teachers who’d held an assignment for 20 or more consecutive days. There could be more emergency teachers serving in a short-term capacity. Within OSPI’s data, most of the growth of emergency teachers is in the emergency-substitute category. Their ranks grew to 1,094 this school year, up from 473 in 2015-16. Most districts provide emergency teachers with additional training in the subject they’re teaching — but the extent of the help they receive differs, according to Flores. It can be anything from a mentor to financial support for college courses. But that’s a Band-Aid, she said, for the state’s problem with recruiting and retaining qualified teachers, which affects low-income students more than others. “Kids in poverty need to have the most credentialed, effective teachers if they’re going to get out of poverty,” she said. Larger districts, Kinnenun said, have the flexibility to fill core subjects with certified teachers, even if they’re asking an English teacher to teach math. Small districts don’t have as many options. OSPI hopes to establish a database that will allow it to better track teacher vacancies and help with teacher recruitment, Flores said, but doesn’t have the funding to do so.